Last year, I ended up in the hospital. The experience was scary, but what was even scarier were the massive hospital bills that started pouring in once I got home. I quickly exhausted my emergency savings and, out of options, I turned to my credit cards to pay the remaining bills. It was a costly mistake. The high interest rates on my credit cards caused my balance to balloon, and I ended up paying back far more than I originally owed. It was a hard-learned lesson that cost me thousands. 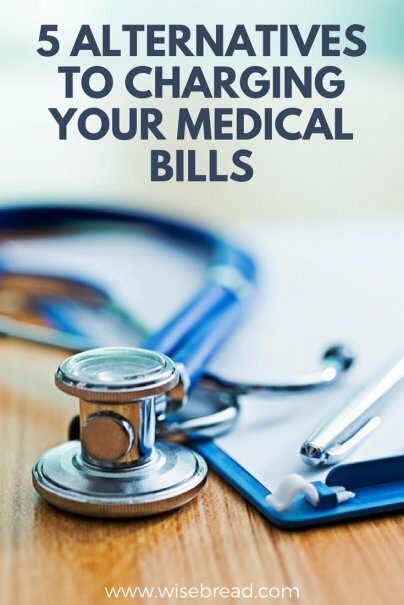 If you're like me and facing serious medical bills, it's important to know that there are other options available to you that are less costly. If you need help, here's what you need to know before handing over your credit card. The cost of health care is a serious problem for millions of Americans. According to the Kaiser Foundation, 26 percent of U.S. adults say that they or someone in their household had problems paying for a medical bill in the past year, or couldn't pay their bills at all. For some, an inability to pay means they will put off necessary treatments. For those who went to the hospital, they could leave with huge amounts of medical debt, causing them to fall behind on their other bills or even file for bankruptcy. Many people turn to credit cards to pay the hospital bills, but doing so is an expensive decision. According to Bankrate, the average credit card interest rates are currently hovering above 16 percent. That means that the bill you charge can grow significantly over time, adding hundreds or even thousands to your credit card balance. When you don't have enough money in the bank, a credit card might feel like your only option. However, there are other resources you can use to pay your medical bills that are more cost-effective than a credit card. Some hospitals and health care practitioners offer payment plans for low-income patients. With a payment plan, you can split up your bill over several months or even years. You can pay your bill a little at a time, rather than coming up with thousands at once. If you can't afford your bills even with a payment plan, ask the hospital's billing department about any charitable funds. Some places have money they set aside to pay for treatment of patients who can't afford to pay the bill themselves. If your hospital doesn't offer any financial assistance, you might be eligible for aid from a separate nonprofit. Organizations like HealthWell, Catholic Charities, and the Children's Health Fund may be able to help you with your with medical bills. Some offer upfront cash assistance or will even help you negotiate a lower bill. You can contact United Way's 2-1-1 Information & Referral hotline to find out about programs in your area.